The SATA 6Gbps standard is coming in the second quarter, says Conrad Maxwell, SATA-IO marketing chair. SATA drives now make up nearly 100 percent of the desktop and notebook PC markets, and has 30 percent penetration in the enterprise market. But the connector is still catching on in retail retail PCs and external boxes (now at over 25 percent). And E-SATA (external SATA) penetration on channel motherboards is up to 60 percent. A big growth area for E-SATA: 85 percent of new laptop PCs gained E-SATA in the second half of 2008, thanks to the use of a clever two-in-one USB 2.0/E-SATA port. This port didn't originate from the SATA-IO standards group, but has clearly gained significant traction. The third -generation spec for SATA doubles the speed from 3Gbps to 6Gbps, says Mawell. Products and the full spec are coming in the second quarter of 2009. The intention is to double the E-SATA spec, too, to 6Gbps. "This will help consumers transmit data faster," says Mawell. 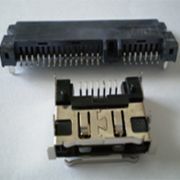 "It's backward compatible with SATA-1.5Gbps and SATA-3Gbps same connector and cable as before, so it will automatically adjust the speed based on the device support." SATA 6Gbps drives will be shooting for performance that exceeds that of USB 3.0 and of Solid State Drives. Also coming with the new spec: Power over ESATA (ESATAp), which allows 5Volts or 12Volts of power to be delivered via the ESATA port. Maxwell expects we'll see SATA 6Gbps appear in enterprise and SSD storage first, then see it trickle down to performance PCs and notebooks.